The Fiesta is Europe's No. 2 best-seller. MUNICH -- Ford of Europe's new-car sales fell by just under 1 percent in October but climbed nearly 13 percent across its main 19 European markets, helped by scrappage schemes. Ford's 8.8 percent October market share in its 19 main European markets was its highest for the month since 1997. Ingvar Sviggum, Ford of Europe's head of marketing, sales and service, said Ford had its strongest October in those markets for 12 years, helped by booming sales of the Fiesta and Ka models. "We're now the clear No. 2 best-selling brand in the European auto industry," he said. Volkswagen is Europe's top brand by unit sales. Sviggum said Ford is increasing higher-margin sales to private customers, compared with sales to businesses. "In October, 64 percent of our car sales were to retail customers, compared to 48 percent in October 2008," he said. "Last month, 80 percent of Fiesta, 75 percent of Ka and 70 percent of Kuga sales were to retail customers," Sviggum added. Ford's sales in its 51 European markets including Russia and Turkey dropped by 0.8 percent to 132,400 in October, compared with the same month last year, and by 10 percent to 1.39 million in the first 10 months. Sales in its main 19 markets including the big markets of Germany, Italy, Spain, France and the UK rose by 12.8 percent to 121,000 last month. In the first 10 months sales were down 3 percent to 1.22 million. Sviggum said sales of the Ka minicar more than doubled in the first 10 months to 90,500. He added that: “Fiesta sales are now more than 500,000 units globally since the car was first launched in Europe last year," he said. Small cars such as the Fiesta and Ka have benefited from government cash incentives that encourage buyers to scrap older cars for new models. Sviggum said 2010 is “something of an unknown quantity” with the ending of the scrappage schemes expected to hit sales. Ford is forecasting sales of between 13 million and 14.5 million units in Europe, down 2 million vehicles versus this year. “Given the ongoing weakness in the European market, further actions are needed at both the national and EU level to help bolster consumer confidence and demand," Sviggum said. Ford increased its 10-month market share by 0.5 percentage points to 9.1 percent, the best October year-to-date share for Ford since 1999 in its main 19 European markets. In October, Ford was market leader in the UK, Ireland, and Hungary, and the leading imported brand in Italy and France. In Germany, Ford's sales in October were up 33 percent or 6,000 units, giving the brand its best October results since 1998. 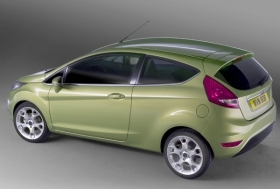 The Fiesta with 41,300 units sold last month is Ford of Europe's top seller and Europe's No. 2 selling car.